Every bride wants to be stunning. And every bride wants to be original. This is seen in the way you plan your wedding ceremony and what you wear for the various events. 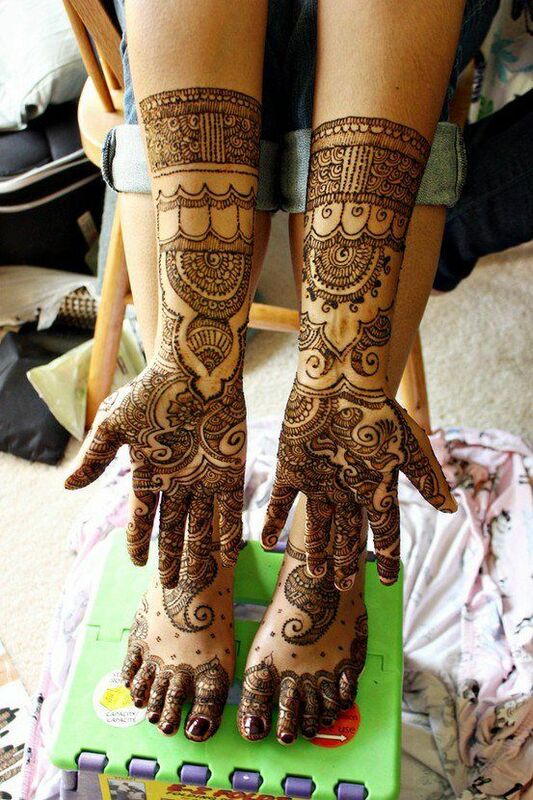 Never forget, mehndi is an integral part of your bridal outfit. It is an age old tradition synonymous with marriage, a bride is never complete without arms full of fragrant, beautiful mehndi. 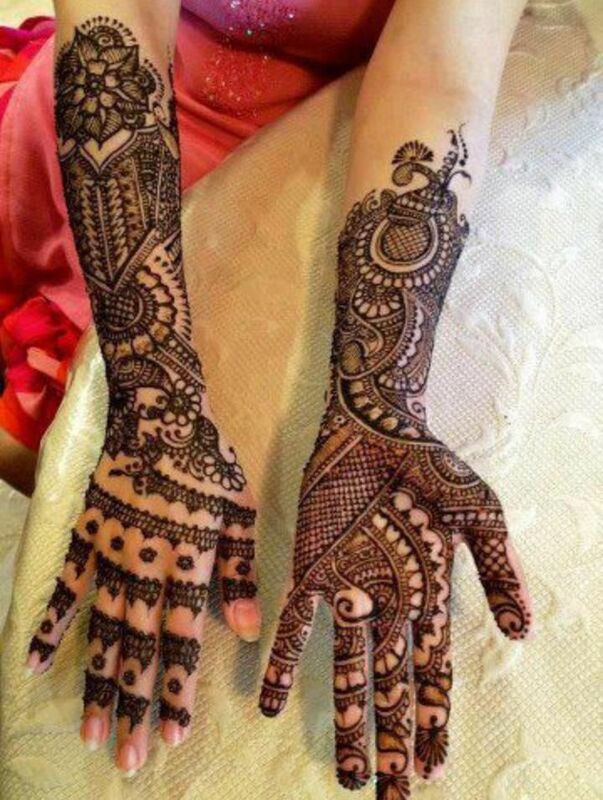 For those of you who dismiss this tradition, mehndi was used as a way to calm the bride’s nerves before the wedding. Not much has changed since the old times. The stress of planning a wedding and starting a new life can really get high when it comes to Indian brides today. So if not for the ornate beauty of this tradition, then do it for your nerves. 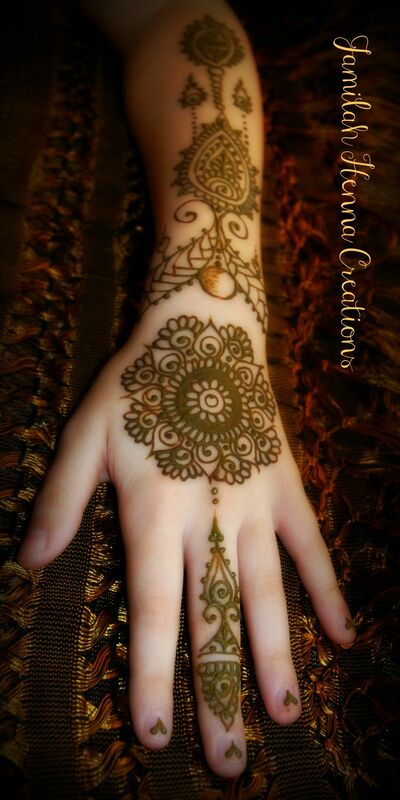 Pick the perfect mehndi designs for you and get started. 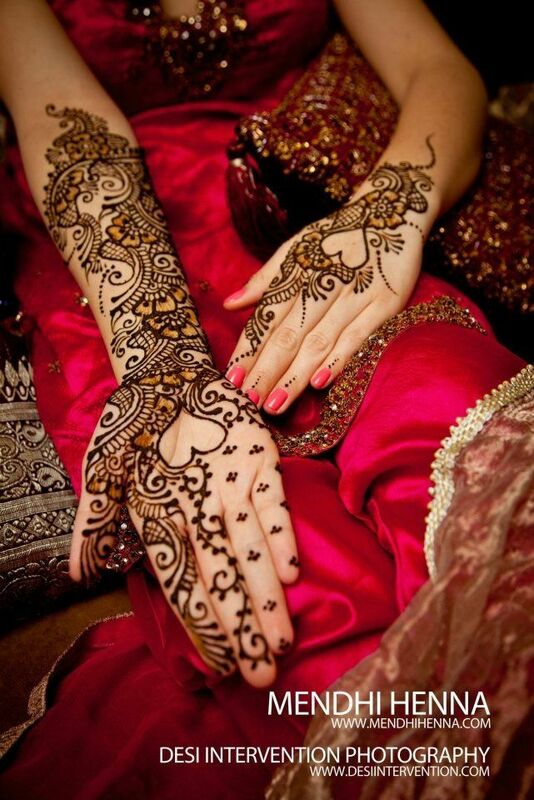 Now, what kind of mehndi designs you pick depends upon every bride’s tastes and what she will wear for her wedding. If your wedding is a simple, small affair with close family your outfit would also be more modest, right? Well, the same applies for mehndi. For a small ceremony keep your designs simple, sorted and open. Intricate, elaborate designs often look over-the-top when it comes to small weddings. 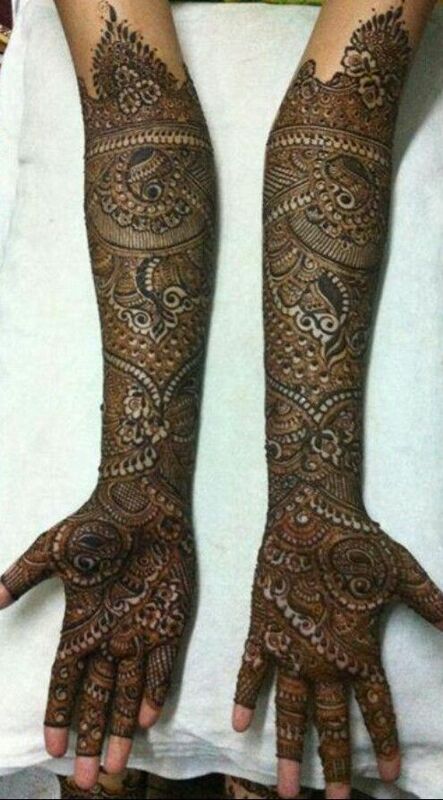 So opt out of elbow length mehndi designs and stop at an inch or two before your elbow. Pick a design that breathes and does not look cramped. 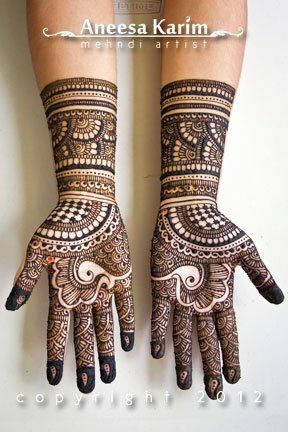 When you go for this length, you can choose Arabic mehndi designs or even a traditional Indian one. You could even do a combo of intricate design, which allows for space. Feel free to experiment, embellish so that you enhance your design and make it your own. Just remember, if your palm is light on the mehndi, the back of your hand should be lighter. 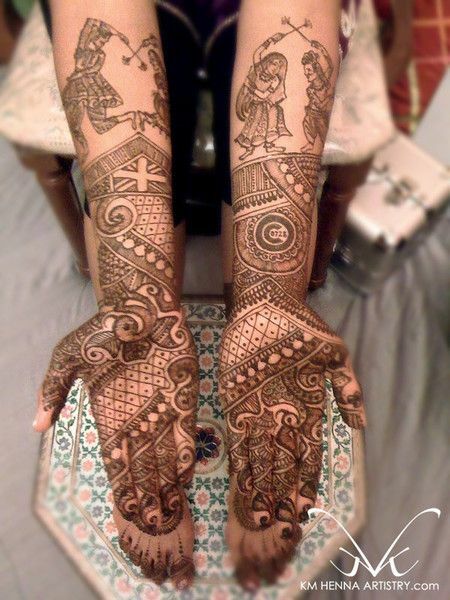 If you do go for an elbow length mehndi design, go for one that stands out. Depending upon your ceremony, choose the length and design elements. 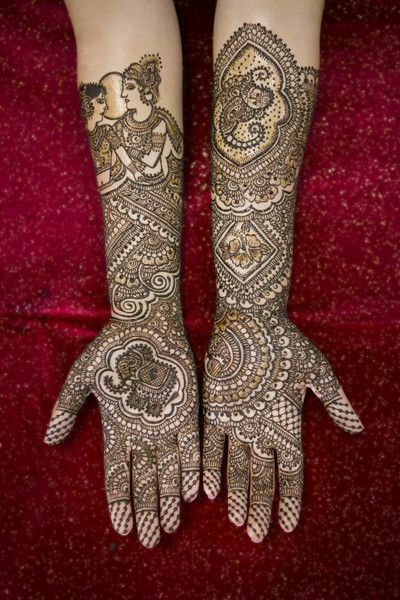 The most popular trend when it comes to mehndi designs for brides is abstract elements. Small things like circles can be made to look absolutely gorgeous when mixed with the traditional mango designs. Speckled with stars and dots, these designs can fill up your hand without making it look too jarring and obtrusive. The best part about a design like this, is that it can go with your traditional shaadi ka joda and your swanky reception outfit perfectly. An immense amount of detail goes into creating a design like this – it is all the more difficult to find your to be husband’s initials in a design like this, which means all the more fun! 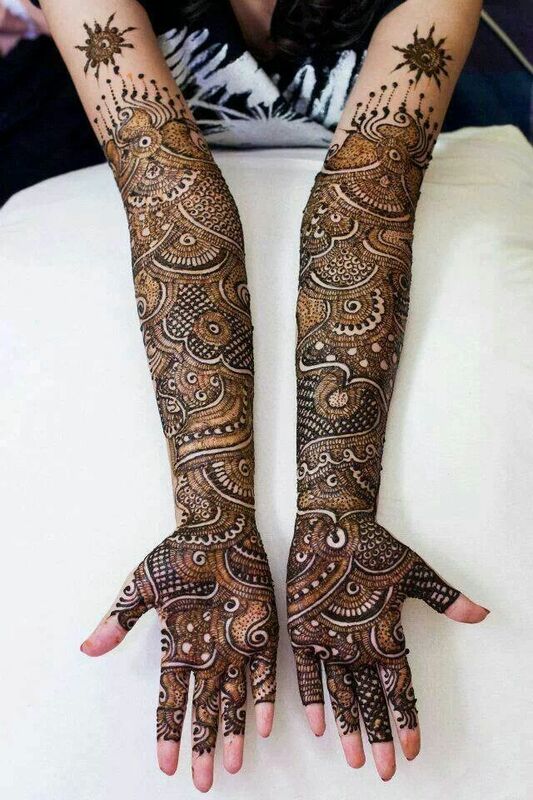 Let’s not underestimate traditional mehndi designs. They too, have their own charm and beauty. 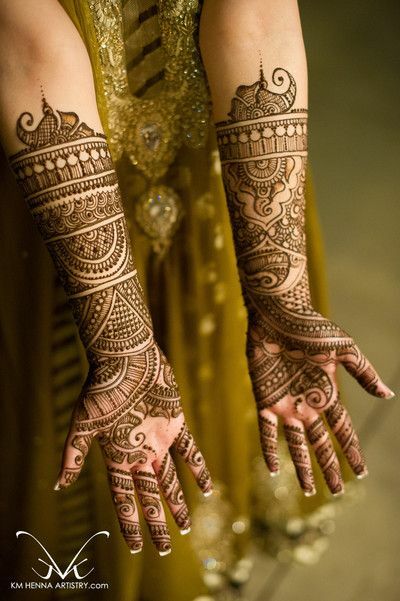 If you are going the whole haul on a traditional wedding outfit you may as well complete the effect with some stunning traditional mehndi designs. There’s so many things you can incorporate in a design like this. To begin with, all such mehndi designs tell a story. They could show peacocks, the bride and the groom or anything else in a really interesting way. My favorite is the one where we see the bride and the groom playing dandiya, it’s playful and beautiful at the same time. Unimaginable skill goes into creating something like this, but the effect is absolutely mesmerising. Remember to pick a mehndi artist that you are sure of. Possibly someone who your friends or cousins have experienced. You could even choose to give it a trial run for your engagement celebration if you are planning one. This way, you know for sure that your hands (and feet) are in good hands! Click on each image to view them larger! ← It’s My Birthday Today!